Mice exposed to high doses of a common plasticizing chemical in utero exhibit significant reproductive alterations and precancerous lesions as they grow up, according to a new toxicology report appearing in the journal Reproductive Toxicology. Phthalates are widely used – in soaps, cosmetics, plastic containers and toys – and exposure to them has previously been linked to reproductive problems in males. This particular study, carried out by Brown University researchers, looked at the effects of monoethylhexylphthalate (MEHP), the chemical that results when animals ingest and metabolize the industrial phthalate DEHP. Until now, no one had done such a study on the effects of exposure to MEHP in adult mice while they were still in utero. To conduct the study, researchers Mary Hixon and Benjamin Moyer fed either pure corn oil or corn oil laced with three different concentrations of MEHP (100, 500 and 1,000 milligrams per kilogram of body weight) to pregnant mice in days 17 to 19 of their term. Then they looked for several effects in the mice and their female offspring as they matured over the next year. 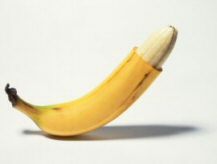 Hixon said that even at the highest doses, the parent and offspring mice appeared outwardly healthy. Maternal and pup body weights were normal at birth and the pups grew as expected. But when the MEHP-exposed pups grew up and bred, several significant reproductive changes became apparent compared to the mice that weren’t exposed. Those exposed to the 500 mg and 1,000 mg doses started estrus (being in heat) late, but then stayed in it for a longer time each month. The offspring mice exposed to the highest dose also delivered significantly larger litters of eight or nine pups than unexposed mice who typically bore five or six pups. Over time, however, the most exposed mice were able to bear pups for less time. Mice exposed to the 1,000 mg dose in utero were no longer able to bear a litter a month earlier than unexposed mice. The researchers found that highly exposed mice had more reproductive follicles than mice that weren’t exposed. Early in the shortened reproductive lives of the highly exposed mice, the researchers also found higher levels of hormones like estradiol, but after a year, the estradiol levels of those mice were significantly less than in control mice. By then, however, the higher estradiol levels had done permanent damage. 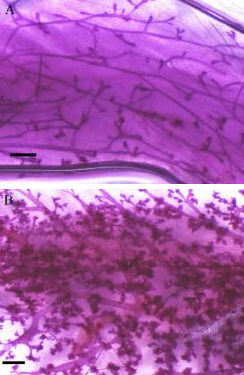 The mammary glands of highly exposed mice exhibited a visibly striking degree of abnormal cell growth (normal tissue is imaged in the top image, while the abnormal tissue appears below). The findings indicate that a high level of in utero exposure to MEHP causes female mice to have a shortened but more intense reproductive life, possibly because greater hormone levels induce an elevated number of follicles to release more eggs per estrus cycle. Their lifetime egg supply is therefore used up sooner and along the way their mammary glands end up significantly altered. The researchers said they can’t be sure what underlies all the changes in reproductive physiology that they observed, but they did find more than 80 genes whose expression was altered. Hixon cautioned that the findings were based on high levels of exposure, something that people or animals would not usually encounter. “For these doses, you’d have to be eating the plastic or drinking the plastic. The real risk is probably minimal for most people.” But she adds that a more realistic exposure scenario might occur from a cocktail effect, when phthalate metabolites react with other chemicals from the environment. “We don’t live in a bubble,” she concluded.